Become the experience in money and buy what you need. 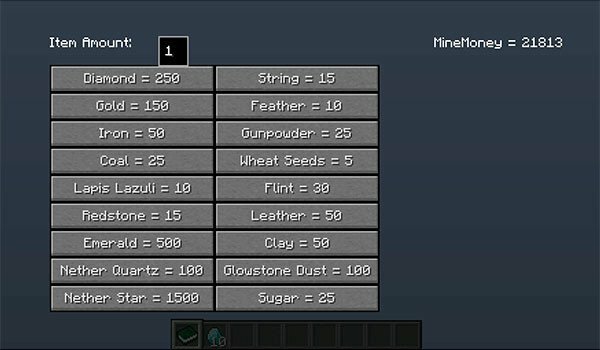 MineMoney 1.8 is a mod that allows us to use our expertise to more than just enchant objects, such as purchase items you need, and get them without having to go looking. To start the mod adds a book called “shoping Book”. This book acts as a shop, that is, when you right-click the book in hand, we will access an interface that will allow us to buy various items such as diamonds, iron, Wither Star or other useful objects. The currency is called “MineMoney” and is somehow related to our experience, but is not proportional. That is, if we have 10 levels of experience, not have 10 MineMoney, if not more. Approximately we can buy a diamond for 10 levels of experience, and Whiter Star for 31 levels. Happy shopping! How to install MineMoney Mod for Minecraft 1.8? Buy at a store everything you need in Minecraft!